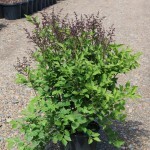 A compact shrub with deep purple buds that open to fragrant, lavender to ice blue flowers on 3" long panicles. Very fragrant blooms in mid to late spring. It has burgundy fall color. 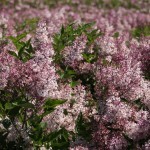 Performs better than other dwarf Asiatic lilacs in the Pacific Northwest. Prune immediately after flowering. Plant in full sun, with a well-drained soil. It benefits from good air circulation.